Yesterday was my mum's birthday. For the past three years she's had a massive party. The massive parties meant that I made massive cakes (see number one - a giant chocolate raspberry job, number two - four tiers of double chocolate, number three - ginger and blueberry). It's fun looking over them and seeing how much my baking has changed and grown. This year mum had decided to just have a few people over for tea and have a quiet day (including both of our first-ever facials and manicures - hilarious). I'd been meaning to make this recipe for ages. I've got a bit of a thing for coconut at the moment. The cake recipe is the one I adapted for my Chocolate Swiss Roll with Peanut Butter Mousse - it's unusual but produces incredibly light and delicious results. About a week ago we went on a lovely little walk in this bit of woodland in the valley. 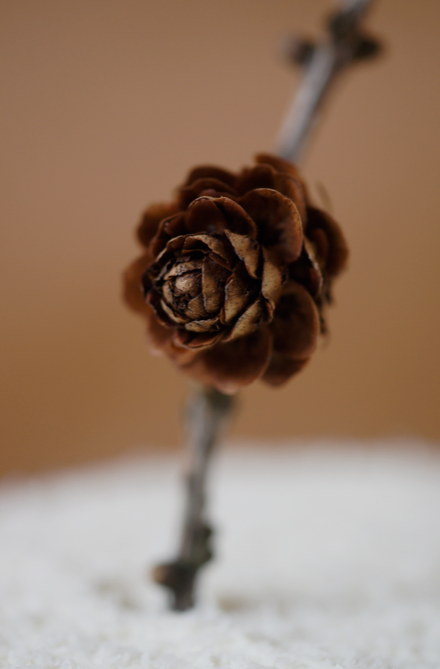 Mum found these beautiful twigs with little cones on them. I thought that they would round out my 'snowy scene' coconut cake perfectly so I carefully transported them home (Arthur wanted to eat them). To keep things hygienic I cleaned the twigs and then tightly wrapped the ends that would come in contact with the cake in clingfilm. Mum also had two candles placed slightly to the side to blow out. I decided to make the cake in a 6" tin to get some height. It shrank a bit when it came out of the oven but still tasted great and the whipped cream filled in the gaps anyway. 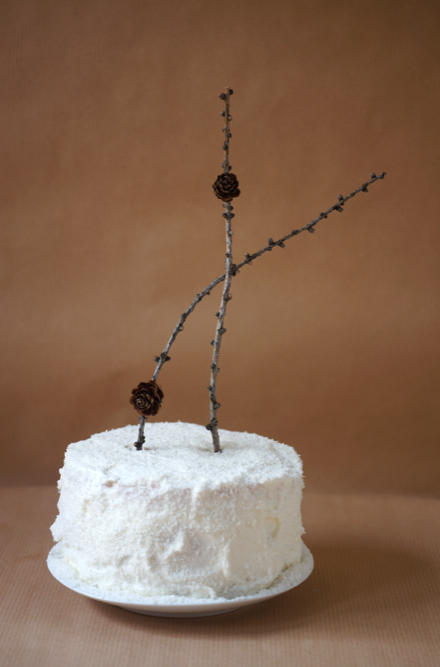 It's not a particularly neat cake but that's part of the snow-drift charm. I wanted to toast the coconut for flavour but didn't want to ruin the pure white look. Another time I might try and source some coconut shavings - the grated stuff here is pretty fine and so a bit gritty. Overall this is a great recipe - it's very light but still packs in flavour. I'll definitely make it again. Combine the 155ml milk with the sugar and vanilla bean in a medium saucepan. Warm over medium heat until the sugar has dissolved and the milk is hot. Meanwhile whisk the cornflour into the 30ml milk in a small bowl. When the milk is ready, scrape the cornflour mix into the pan and whisk together. Heat until the mixture thickens, stirring constantly and scraping the bottom. When thick, start whisking the egg yolks together in a medium bowl and pour the thickened mixture in, keeping whisking. Transfer back to the pan and heat until the mixture starts to boil and is very thick. Pour into a medium bowl and stir in the shredded coconut. Leave to cool and then chill in the fridge for several hours (I did this overnight). Place the water and sigar in a small saucepan and heat gently until the sugar is dissolved. Stir in the rum and leave to cool. I boiled the rum first for a moment to remove most of the alcohol for mum. Preheat the oven to 180C/350F. Grease and line a 6" tin, making sure the parchment reaches up to about 6". Sift the flour, cornflour, baking powder and salt together three times. In the bowl of a stand mixer with the whip attached, whisk the egg yolks and water together on high speed for 1 minute. Turn down and add the caster sugar, then whip on high until the mixture is pale and thick and leaves a trail when the whisk is lifted - about 5 mins. Put to one side. In another clean, dry bowl (I transferred the first mix to another bowl then washed my mixer bowl as I only have one) whisk the eggs whites until stiff peaks. Place the yolk mix bowl on a damp cloth to stop it moving. With your non-dominant hand, slowly start sifting the flour mixture into the bowl while your dominant hand folds in with a whisk. When the flour is totally incorporated, add 1/3 of the whites and fold in with a rubber spatula to lighten the mix. Finally add the rest of the whites and fold in until uniform. Pour into the lined tin and smooth the top gently. Place into the oven and bake for 30-40 minutes until the middle springs back when touched. Leave to cool in the tin for 15 minutes then remove to a wire rack. Whip the cream until soft peaks then sprinkle in the sugar. Whisk in the sugar but be careful to not overwhisk - it should be soft and pillowy. Slice the sponge into three layers and place one piece on the serving plate. Sprinke 1/3 of the rum syrup over the sponge. Spread half of the filling over the sponge. Repeat with the next layer. Add the final sponge and sprinkle the remaining 1/3 syrup over the top. Leave to chill in the fridge for 4 hours. When ready to serve, whip the cream and spread it over the cake. Sprinkle the coconut over the top. I then had to sort of throw coconut at the sides - if I'd tried to press it I would have had a handful of cream. When covered add any candles/decorations and serve. Best eaten on the day. Happy Birthday to your Mom. I love taht you wrapped the twigs in cling film. Very thoguhful of you- I wouldn't have bothered!! Happy B-day to your mum, that cake is super-uber-cute and adorable, I bet quite tasty as well. It was a lovely birthday cake. It tasted delicious! Surprisingly, it was still excellent today having been kept in the fridge overnight. What at lucky mom you have! 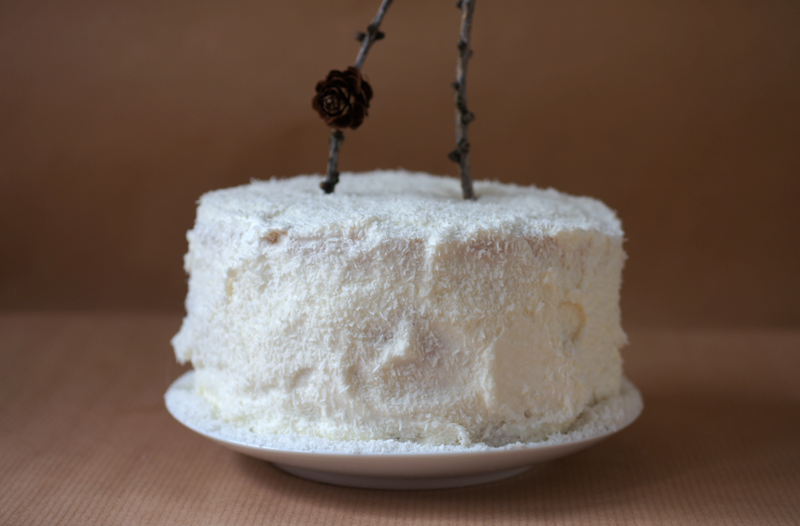 I am such a sucker for coconut and especially coconut cake. 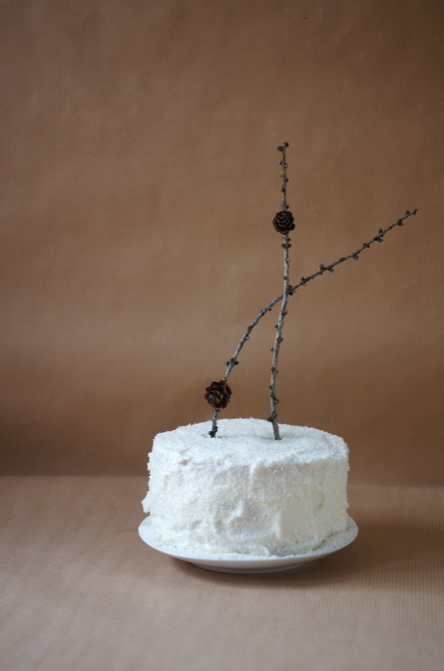 And topping the cake with branches is so elegant. So pretty! 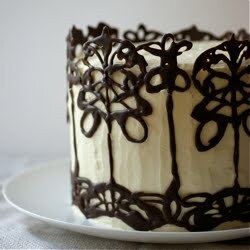 Your baking is always like a piece of art! For the sponge you haven't mention cocoa powder among the ingredients but you do say to shift it together with the flour etc. The cream we have prepared and it seems so little for a 3 layer cake. Are you sure about the 155ml+30ml milk? Anon - Sorry, that's a mistake, there is no cocoa powder. I'll change it now - thank you for pointing it out. As it's a small 6" cake and the cream is only split into two (between the 3 layers), it is a small amount (I also generally err on less frosting/filling as I prefer it that way). Hope that helps. It does make for a dense cake - I have a chocolate coconut cake recipe that uses milk in the sponge but it's meant to be a bit fudgy. Funny how dense and fudgy is good in a chocolate cake but not elsewhere! This means that you literally kill fat by consuming coconut fats (also coconut milk, coconut cream and coconut oil).